In January of 1960, TIME ran a cover story headlined "That Population Explosion." 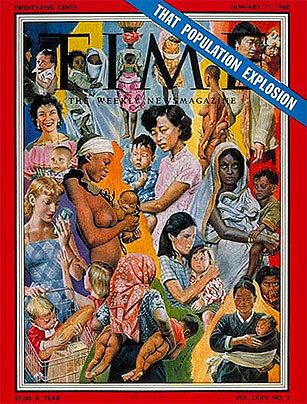 It featured a chaotic collage of women from around the world, their babies bursting from the magazine's red margins. Eight years later, Paul Ehrlich published The Population Bomb, which predicted mass starvation and upheaval. The thinking then  and it persists now  was that population growth would hasten our demise, because, well, there's just not enough to go around. A new report by the U.N. Population Fund (UNFPA) challenges that thinking. In People and Possibilities in a World of 7 Billion, the agency zooms in on the vastly different population scenarios playing out across the world. In some countries, high fertility rates hamper development and perpetuate poverty. Elsewhere, low birthrates threaten growth. "The key question is no longer 'Are we too many?'" Dr. Babatunde Osotimehin, head of the UNFPA, tells TIME. "We have such different challenges and opportunities around the world." Many of those challenges, and indeed many of the possibilities, relate to fertility. In the world's least developed countries, the fertility rate is about 4.2, with sub-Saharan Africa reporting a rate of 4.8. Such high rates come with economic and social costs. In Mozambique, for instance, health experts found that women who did not space their pregnancies by two years were more susceptible to illness and, in turn, less able to provide for their families. U.N. research also found that the country's relatively small formal economy struggled to absorb the large number of young people entering the labor market each year. But a "population bomb" isn't inevitable. Fertility rates change. In the 1950s, the average woman gave birth to six children. The average is now 2.5. That decline is both cause and effect of economic development. As women get wealthier, they tend to have fewer kids. The drop also reflects the fact that women's societal roles are changing. "Where women have been empowered, fertility ideals have changed," says Osotimehin. "In Brazil, the fertility rate has been reduced because women have been educated. They have been allowed to hold jobs. They make decisions on theirown." Access to modern contraception is also critical. In 2005, the U.N. World Summit vowed to make reproductive health universal by 2015. There has been some progress, but there are still 46 countries where 20% or more of women who are married (or living in a union)have an unmet need for family planning. "We need integrated health programs where women have access to family planning," Osotimehin says. There's no doubt that the report's "7 billion people, 7 billion possibilities" tagline reads a little rosy. To the extent that it shifts the debate from 'crises' to constructive action, it's worth a look. As the UNFPA chief told me, 7 Billion Day "isn't about numbers." It's about people, poverty and human rights. See "Census Update: What the World Will Look like in 2050."